A derivation of the card game Basset, Faro originated in France in the late 17th century. First known as Pharaon, it became extremely popular in Europe in the 18th century. With its name shortened to Pharo or Faro, it soon spread to America and became the favored game during the California Gold Rush. 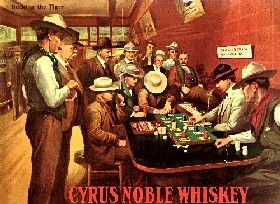 The game then spread into gambling halls all over the American Frontier, with such illustrious names as Doc Holliday and Wyatt Earp, often performing the task of a Faro Dealer. 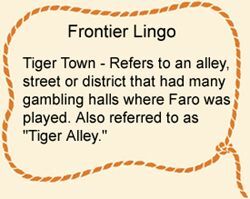 Not a direct relative of poker, Faro was played alongside its other popular counterpart, and played by the masses, due to its fast action, easy-to-learn rules, and better odds than most games of chance. 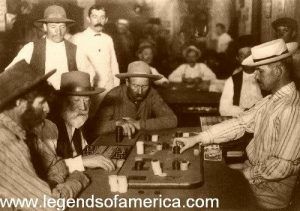 From 1825 to 1915, the game was the most popular enticement in almost every gambling hall in the American West. The Faro layout consists of a board where one card of each denomination is displayed at the top of the table, usually in the suit of spades. 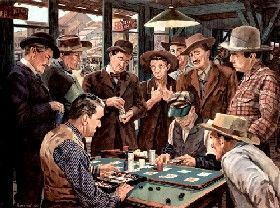 As the game commenced, each player would lay his stake on one of the 13 cards, or could place multiple bets on different cards. There was also a “high card” box at the top of the layout, which players could bet on. After the banker burned a card, he would then deal a card, referred to as the “banker’s card,” and place it to his right. He would then deal another card, called the “English card” or “player’s card”, placing it to his left. When these rules are reviewed, it becomes obvious, that there is no significant edge for the dealer, or “house, which resulted in cheating by the “banker” becoming commonplace. Trick decks, sleight of hand, and forms of modified automatic dealing boxes were employed to give the house a better advantage. In fact, cheating became so prevalent that editions of Hoyle’s Rules of Games book began their Faro section with a disclaimer, warning readers that an honest faro bank could not be found in the United States. One of the better known cheating dealers was Soapy Smith, who at his Tivoli Club in Denver, Colorado, had every one of his Faro games gaffed. Due to the extremely low odds for the house, legitimate Faro was virtually gone by 1925. However, when the State of Nevada legalized gambling in 1931, the game made a short revival, but by the 1950’s, it had gone out of fashion once again, as more profitable house games such as craps and roulette were promoted by the casinos. By this time there were only five active faro banks known to have been in existence in Nevada , the last of which was in Reno and closed in 1985. Today, the vast majority of young American gamblers have never even heard of Faro. Images available for prints and downloads HERE.